Technology has become a huge part of our everyday life. Groundbreaking and earth-shattering inventions are now taking over every aspect of our lives on a daily basis. Now, Hi-tech military wrist watches have crept into the military world to assist them on the battlefield. Take a look at some of our handpicked best military watches. Most of these military watches come with different styles and high-end features like GPS capabilities, Digital, Compass, and waterproofed features. The use of this timepiece keeps you updated with potent information about your external environment. These features are the perfect choice for those who are in need of a decent watch that can stand extreme weather conditions and unfavorable elements. And this includes law enforcement officers, hikers, soldiers, mountaineers, hunters, extreme athletes, and anyone who pushes the boundaries of life. So which brand offers the best military watches? This post presents my honest review of the most efficient Military watches you can find in the Market. With those in mind, let’s look at the best tactical watch in 2018. If you are looking a multi-function tactical watch that comes with the finest triple sensor technology, then the CASIO PRO-TREK is for you. The PAG-2401CR sensor functions as a barometer, digital compass, a thermometer and all essential features you would need for your outdoor activities. The CASIO PRO-TREK Tactical Watch is a high-quality timepiece that is made of a plastic design that sits comfortably on your wrist. It has plastic flippers that help to keep the watch situated nicely and also a bezel at the top of the watch that rotates smoothly. The home screen does pick fingerprint easily. You don’t have to worry about the glass because the bezel is high enough to prevent the screen from scratches against hard objects. The primary reason this watch sits among our top list of military watches is that it does almost everything you will need in a watch. The amount of information you get on the home screen is incredible. The PRO-TREK is a solar atomic device that features an atomic indicator for receiving signals. The indicator tells when you get a signal. It weighs 65 grams, and if not for its rather large size, you wouldn’t know you were wearing a watch. The watch charges in any light transmission, so you don’t have to worry about battery life. When you wear this on a full charge, the watch will last you approximately five months without further exposure to light. But if the power saver function is turned on, it will last you 23 months without further exposure to light. So, what the power saver mode does is after 10 p.m., if the watch is inactive for an hour, it will turn the display off to save a little extra power. If it is also inactive for six days, it will turn off non-essential functions except the time. The screen is very high contrast. The home screen features the current day, the time, and the tilt graph which has three different settings to keep track of weather conditions. I also love the fact that this timepiece comes with five daily alarm settings that allow you set series of alerts. You will also find a button that stops and starts the stopwatch. That means you can accurately set your timer. Unfortunately, you can’t program the timer in seconds; you only can do it in minutes. Also, the alarm time is short lived. I wouldn’t advise you to use it to wake yourself from sleep. But it comes in handy when you use it to remind yourself of something. The only watch that tries to measure up with the PAG-2401CR ‘PATHFINDER’ regarding display is the PLW 15100. But I was sold to this particular watch. One of my big complaints about other brands was that the light was too quick to turn off. Apparently, Casio Pro Trek has remedied that option by allowing me to choose between 1.5 seconds back-light and a 3 seconds backlight option. The watch is 100% water resistant. The Solar battery is an excellent feature that separates this guy from the crowd. The stopwatch works pretty well. There’s no loss of time. The alarm does not have a snooze mode. The resin and plastic band that comes with this watch makes it look cheap. The Pathfinder Alarm is pretty wimpy and short-lived, so don’t use it to wake yourself. The features that come with this brand are very accurate. If you’re looking for an overall watch and you don’t want to spend a lot of money, I’d highly recommend you giving the CASIO PRO-TREK PAG-2401CR ‘PATHFINDER’ a try. You are going to be glad you did. After wearing this watch sometimes now, I’d say am still very pleased with this Pathfinder. Definitely deserves a spot on our best military watches list. The Rangerman is the first G- Shock series to use a triple sensor multiband feature, and other high-end features. The device has been designed to handle grueling and hard conditions you may encounter. The Men’s Casio G-Shock RANGEMAN comes with a unique design you won’t find in any other military watches. The G-Shock can withstand abuse, unfavorable conditions and it’s water resistant. Despite its large design, the G-series can fit in perfectly into your wrist. Unlike the G-100 that offers a flexible layout, the RANGEMAN comes with a high-quality black resin design, red accents and gray design. Like most G-Series models, this timepiece features a triple sensor that combines a barometer, a thermometer, a compass and an altimeter. To use the triple sensors, you will have to push the middle right button of the watch. A single beep will indicate the altimeter mode, and this will display anywhere from a negative of 2300 feet to its highest 2800 feet. At another push, two beeps will be for your compass and indicate north, the bearing object, and angle. At a push again, you have your barometer, as well as a thermometer. The Modes come in a metrics. But you can switch from metrics to US measurements in any of this mode. To go back to standard keeping mode, you need to press the left button. And if you push it again you can switch your mode to your world time mode. That will allow you to change time mode just by using the upper and lower right buttons. You are going to find this feature a great tool for traveling. The countdown time that comes with this brand can measure from one minute up to 24 hours. Once it gets to zero, it will produce an audible sound. Just like the Pathfinder we reviewed, the G-Shock RANGEMAN comes with five different alarms to choose from. You can turn it on and off by pushing the upper right button. One of them has a snooze and an hourly time signal. You can scroll through by using the alarm Button. You can scroll on different dates and see the different sunset time. The timekeeping mode will display the time. The size and weight of the Rangeman are quite large, but it’s lightweight and comfortable, weighing 93 grams. The timepiece has a protective crystal window display which is scratch proof. Also, the watch features a digital window to help you record digits quickly. If you are a mountain climber, then you are going to find this watch as a good partner because it features an altimeter for measuring altitude. Moreover, you can also predict weather conditions with this device because of its barometric feature. The G-shock watch is made of a sturdy and durable design. The watch can take a beaten, and will still work fine. The watch is comfortable to wear and at the same time lightweight. Last long battery life compared to other models. The screen is quite difficult to see. Apart from this, the watch is excellent. Overall, G-Shock RANGEMAN is the ultimate survival tool that does a splendid job. It is not only shock-resistant, but it’s also mud and water resistant up to 200 meters. Have you ever wished for a military watch that has perfect accuracy, extreme precision and can withstand hard conditions? Well, now you have it. The CASIO G-SHOCK GA100-1A1 happens to be our favorite Military watch under $100. It offers all the high-end features you’ll need in military watches. I have got some good time wearing this watch when I am doing some rugged work. I love the design and extreme precision of this timepiece. The watch is made of silicon & does not pull arm hairs compared to other watches. You can get this watch dirty or wet and wear it in the shower with you. Yes, exactly what you are thinking; the handpiece is water resistant to 200meters under water. The GA 100 comes with a reliable high-contrast which makes it easy for you to use in low light conditions. The watch has a yellowish-orange color background light that stays about three seconds which will enable you to use it at night. However, I would have preferred it if the hands were luminous, which will allow you to charge it with a flashlight to make it glow. Another drawback is that the digital portion of the watch is quite difficult to view because of its black background and dark leathery. So that means is you have to turn the watch towards you to be able to see the digital angle clearly. Another nice feature is its audible alarm that allows you to set the watch anytime the day. I love the fact that it has four alarms which are okay if you have four different things you need to be reminded of during the day. The GA100-1A1 also comes with a standard battery that can last you for approximately about two years. The Casio watch is magnetic resistant which means it can resist any magnetic substances. The timepiece also offers 29 different World time zones. So, you can set the time zone of your choice. You can also use the stopwatch feature and countdown timer in a running or hiking adventure. Another cool thing is that it has the 12 and 24 hours’ time format that a lot of digital watches have. The Four negative displays are easy to read. All of the buttons are durable and well protected. Solar systems cannot power this device. The digital portion of the watch is quite difficult to read which makes it a little bit useless. I’ve been using this watch, and I can boldly say I’m pretty satisfied with this watch. With this brand, you’re going to get one of the best military watches for this value. If there were watches that came with a unique design for active men, then that would be from Bertucci. We found this brand while traveling and I was privileged enough to meet a friend of mine in the military who had an excellent time with the watch. He explained to me that the goal of the Bertucci timepiece was simply to be a great watch. The company took the time to look at the way the people wore their watches and what they’re doing when they wear them. Well, this sounds like a pretty basic concept but led to some design features and choices of material that aren’t readily available in other brands. The Bertucci A-2S is classified as a field watches by looking at them. It’s pretty easy to spot the military influence. They aren’t made to track running pace or tell what the time it is in five different cities or the air temperature and to do other stuff. They are made to do what watches were originally intended to do, which is to tell the time and it looks great doing it. 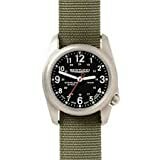 The Bertucci A-2s field watches comes with 100% titanium which makes them light and very durable. The solid titanium case has a high polish finish that makes it look stunning. The watch face is made from hardened Sapphire and mineral glass crystal, both of which are scratch resistant. It has a Swiss-made all metal quartz movement and some excellent super-luminous hands and markings which are a big plus because it allows you tell the time in the dark. It also has a screw down crown at the four 0’clock position. The watch has a 200-meter water resistance. The watch weighs 73 grams which made it very light. The sizes are 42 and 44 millimeter wide with a solid titanium case and 11 and a half millimeter thick. The 44 millimeter is for people who like a bigger watch or thick wrist while the 42 are perfect for thinner wrist or individuals who like a more understated appearance. This great watch has a low battery indicator. Basically, with this Bertucci watch, the low battery indicator causes the second hand to skip. It allows you to know that the battery is out and that it’s pretty much time to change it. It’s a huge benefit. The device is built to last you long-term and also come with an elegant feel on you. The timepiece can withstand any form of abuse it encounters. I spend a fair amount of time on the computer at work, so wearing most watches weren’t always comfortable on my wrist when typing on the keyboard. The Bertucci watch stays fit to the wrist like you aren’t wearing anything and it is way comfortable, unlike others. The manufacturers took a great look at what most people do when they wear watches, sum up the ideas and made a great watch. The Bertucci A-2s field watch is extremely durable and comfortable; it looks great and is very functional. 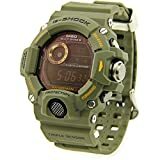 I am a lifelong Casio G-shock fan, and I am not surprised that one of its Series is on our top list of the best Military watches under $500. The G-Aviation is the first GPS Atomic Solar Hybrid from Casio. It is one of the most expensive G-shock military watches. However, there are other G-shock models that you can spend thousand dollars. But this one came with a reasonable price and had garnered a lot of cool stuff. If you want a military watch that is somewhat a little grown up, premium and on top of the line, then this product is for you. The GWA-1100-1A3 G-Aviation Series comes with a ton of technology, as well as a tremendous amount of durability. It offers a lot of premium functionality inside a very durable package: also with a compass and two sensors. The case size is the first obstacles to consider this wrist watch as a wearable option. It can tell if your time is in daylight saving time mode and standard time. The watch comes with few indicators. We have the 24-hour indicator, world time indicator, and the day of the week indicator. It also has a full automated calendar. The GPS technology in each function offers timing information based on your location. The Triple G feature means it can withstand not only shock but gravitational force, as well as vibration. The watch is skillfully designed to be able to absorb vibration and shock. The watch has been tested to withstand over 50g of gravitational force and 20g of vibration. When it comes to protecting the movements inside, the Triple G features a resistant technology that enables the watch to withstand vibration. The Casio Smart Access technology is very easy to use. All you need to do is unlock the button, pull it out, and then you can just indicate what city you are setting the time zone. One of my favorite aspects of this watch is the entire reflective Crystal that protects the watch from scratching easily. The timepiece allows you to set the time to any time zone of your choice. It also can automatically adjust the time zone to the current time that you set. The Shock Aviation series is radio controlled. So that means it can connect all six towers across the world to keep it accurate. The next mode is the chronograph which has a flyback feature that helps you set the time in seconds, minutes and hours. The button is very easy to use and functional. I am impressed with the overall construction. It also features a countdown timer that enables you to set the time from one minute to 60 minutes. Once the timer is complete, there’s an alarm that will sound for 10 seconds. The next mode is the alarm mode. You will need to use the button to see the time for your alarm. The timepiece also offers a rapidly advance feature which will automatically screw on its own. While on timekeeping mode, you will need to push the upper right button to activate your compass which will point north. Unlike other G-stock series, the home screen is pretty clear and easy to read. If you are traveling, this is your watch. It’s one of the most comfortable G-Stock watches to wear when you want to embark on a journey. This bad guy can survive a lot of abuse and still works great. Features a triple G resistant to withstand the shock of gravitational force and vibration. The alarm clock is not loud enough to wake you up from sleep. The Garmin Tactix GPS Navigator is awesome and amazing military watches that come with a lot of advanced features to suit your outdoor activities which make it take the crown as our favorite Military watch with GPS. The device has Bluetooth connection that enables it to connect to some gadget, even to your laptop. You can now receive text message notifications via your watch. The GPS Navigator comes with a matte black finish to make it have an elegant feel. The GPS has some knurling bezeL which doesn’t give in to any reflection, and a Saffire displays to make it resistant to scratches. It is also water resistant down to 200 meters. With this proprietary cable, you can charge the device and use it at the same time. The watch has a battery life up to 50 hours using the GPS. It can last you three weeks using different sensors, and five weeks using the watch itself without any of the sensors or GPS. The timepiece has up to 20 megabits where you can download some stuff into your watch. The watch comes with night vision mode compatibility. So, that reduces the backlight such that it doesn’t interfere when using Night Vision Goggles. The Compass comes in three axes. It will show you the right direction no matter how you hold the watch. The Garmin Tactix features Jumpmaster software that comes in handy when you’re jumping out of the plane in a dark and cloudy atmosphere. The software helps you to navigate to somewhere particular in a coordinate spot. Garmin Tactix features a heart rate monitor that keeps track records of distance covered. It also has auto pause that can put the watch on pause. So, what this does is to show you the information that you might need if you’re like running a mission or something of that nature. It shows you the time of the day, the pace, that you’re going, a timer elevation and also gives you precise coordinates and a map. It has a temple alarm which will trigger a loud sound if you deviate from a pre-determined temple. It offers an accurate GPS when calibrated. The watch is water resistant. You can dive in the ocean with this thing, and it will still work fine. The device is a pretty large watch. So it’s going to be too large if you have a small wrist. The watch comes with tons of functionality you won’t need. It’s quite hard to get used to it at first. The Suunto seems to take the cake has our winner of the best military watch with a compass. The watch offers a thickness of 14mm from the top to the bottom of the casing. The watch is 30m water resistant. The timepiece fits very nicely and is comfortable to wear. It comes with a kind of rubber-elastic silicon band and a black and stainless buckle on it. The compass is pretty accurate in outdoors compared to when you are inside. It shows you when you’re facing the North-East or other directions. One cool feature is you can set up the bearing. And to do that, you have to press the upper right button to tell you the direction you’d need to go. At the right side of the watch, your will find three buttons. The bottom button is the electro-luminous light while the top is your reset button light, and the middle button represents the mode selection switch. On the left side, we have two more buttons that represent the functions of the button. The function button from this set allows you to display the various roles in the watch. The watch also features an indented “U” which represents your Sensor for Altimeter, Barometer, and Thermometer. In the face of the watch, you will see a bi-directional swivel bezel. Round the bezel, it also offers a compass degree for bearing tracking. At the top of the display screen, you will also see a parallel line that is going to show you Barometric pressure trend. The watch presents a reference number for your attitude. For example, you get to camp, after hiking, or biking and you can switch to weather mode to keep track of the weather while you are in camp. The watch also features an automatic switch mode that will automatically decide whether it should be in altimeter or barometer because they both use the same sensors. So, if you go for a car ride or go running around the hill, it can sense quick barometric pressure change. It also features a chart that will show you the pressure change or the trend over last 24 hours. Another cool thing about the altimeter function is that it monitors any high chance from where you press the button and where you start the button. Also, note that if you are wearing the watch on your wrist, it’s going to read what is in your wrist temperature. So, what most people do is to take out their watch before going to sleep. By that, if you want to see what the temperature is in the morning, all you have to do is to click the watch. The time mode features a different function. When you press the button at the bottom left, the watch will display different logos. It brings up the day and a date. If you click it again, it brings up the seconds. It automatically has a 10 minutes countdown timer which you can automatically set. The timepiece head is very durable, and all the features work pretty well. The watch is durable. It can last you more than ten years. The band is quite fragile, and it’s prone to cracks after years of usage. The battery life isn’t impressive. A customer complained that he got to change it three times a year. Overall, I will say this watch is great and will serve you long-term. I have had friends who use the Suunto, and they have great experiences with this timepiece. If you are looking for a durable and sturdy watch that comes when hi-tech functionality this watch is for you. 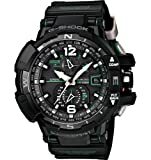 The favorite on our best military watches list is the Casio Men’s G-shock Classic. The classic comes with a 40mm case diameter case that is perfect for your wrist without being too bulky or large. The digital watch is perfect because it has toughness and ruggedness of a watch by extremist, athletes, and military personnel. It also got a DL classic light display, a shock resistant and EL backlight afterglow. The Classic watch is a durable timepiece from Casio that offers a brazen black case with a 50mm thickness. The watch features four functions keys to activate the plethora function. Another great thing about this watch is that it is 100% water resistant to 200meters under water. The G-shock classic uses a hardened mineral crystal which is ideal for resisting scratches. The dialing format in this model uses both analog and digital read out. The Classic watch also features different time zones, daily alarms, military time, and resistant magnetic fields. The watch comes with a worth of three years battery life. One Unique feature about this brand is that you can see the LED light at night when you move it from the menu settings. The watch works pretty well for the price. It Features hybrid time display of both Analog and digital time display. Durable, simple and the same time lightweight. It comes with a plastic strap which makes the watch looks cheap. Be careful: make sure you order the right size. Most times this watch comes in smaller sizes. 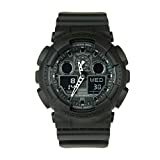 The Casio Men’s G-Shock Classic Analog-Digital Watch is a fabulous looking digital timepiece and does everything you want from a G-shock Wristwatch.